Over the summer break I was listening to the classic Australian comedy “Wired World of Sports” by the Twelfth Man, aka Billy Birmingham. One of the sketches involves a mock interview between “Big Darrell” Eastlake and an unfortunate America gymnast called “Rick Disnick”. I have to admit after a bruising 2018 in markets I did feel a bit like Rick Disnick by the end of it. I was hurting, a lot. Having an investment bias towards Asia and growth was a painful combination in 2018, yet in 2017 it was a very rewarding bias. Over two years it has been the full round trip to where we start 2019. While underperformance is both physically and mentally taxing, the key thing is not to “look back in anger”, but to learn from it. If I look back at 2018 and at what I would have done differently, I would have been more ruthless in cutting losing ideas. In this environment mistakes are punished hard and stocks that suffered often had poor price action leading into confirmation of problem. A classic example of this was CYB which simply never traded well after the Virgin Money acquisition then confirmed a large scale profit warning. The other mistake was having too much correlation to one investment theme: China. Cheap valuations and low P/E’s proved no share price defence as investors simply sold the region relentlessly from late January. Hindsight is a wonderful thing and we all wish we had taken different actions at certain times in our investment careers. I have learnt from 2018 and I am certain it will make me a better fund manager. So let’s move forward into 2019 constructively. After a volatile 2018, which ended in an aggressive global equity market sell-off, it’s nice to turn a new leaf in 2019 and search for stocks that have the potential to generate us double-digit returns from current depressed prices. The most interesting aspect of the December 2018 sell-off was it became indiscriminate by stock and sector. Virtually nothing was immune to selling pressure in the last few weeks of 2018, a market phenomenon which is often associated with a sentiment capitulation bottom. As we have seen, markets have bounced solidly from those December lows, but I’d have to say you generally don’t get a true market bottom until the market itself “returns to the scene of the crime”. I believe we could see a retest of the December lows over the next few months and that would be a buying opportunity in high quality long duration companies that are rarely on sale. On that basis I am holding some cash, waiting to deploy at lower prices with what I would call a “shopping list” of great global companies I hope to buy with a “margin of safety”. It will pay to be a little patient I suspect, but when the moment comes at the right risk adjusted price you must act and put cash to work. One of the stocks on my “shopping list” is Aristocrat Leisure (ALL.ASX). ALL is one of my core portfolio holdings and its underperformance was a detractor from our portfolio performance in the 2H of 2018. The 2H de-rating on ALL was driven mainly by small earnings downgrades in a stock that was heavily owned by momentum investors. The chart below confirms that consensus FY19 EPS estimates have fallen by -4.31% over the last 6 months yet the stock fell -36% from its peak. That is a clear P/E de-rating back to 17.8x FY19 consensus estimates, the same estimates which forecast 19% EPS growth. ALL is now trading back on a price to growth ratio of less than 1x. The P/E de-rating was really about the uncertainty of ALL’s large scale digital investments. Markets hate uncertainty, but particularly so when they see back to back large scale acquisitions, albeit in an area of competence from the given company. This combined with a “momentum” investor register led to an overly-aggressive de-rating. We are now starting to get a little clarity on ALL’s digital investments. The news is incrementally positive and that is all you need in a stock that has been heavily over-sold. A little clarity helps. CY2018 revenues of US$5.193bn were largely in line with expectations; Eilers market growth estimates are largely unchanged (CY2018-22 CAGR of 7.5%). 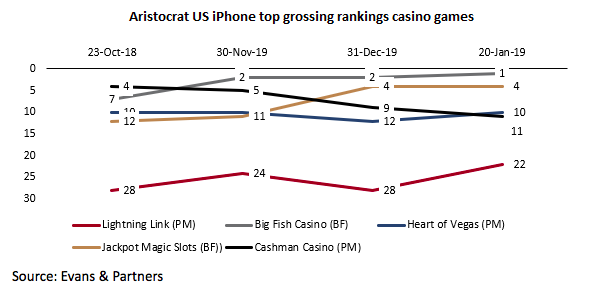 NOTE: The Eilers social casino tracker revenue data is derived from average gross ranking position on the iOS and Google Playstore, 3rd party data, and proprietary estimates. The report’s estimates have historically been highly correlated with company reported social casino revenues. Most of the industry analysts have seen the data now and have made constructive comments about it. Some suggest the run rate is ahead of their expectations and may lead to small earnings upgrades. This is important as it suggests the small ALL earnings downgrade cycle, that triggered the heavy sell-off, is over. ALL stock rose +3.1% on the first day after the US social casino data was released. ALL shares hit a low of $20.66 on Christmas Eve 2018. The technical relative strength index (RSI) bottomed that day at 25, an oversold reading. Since then, the stock has regained the 50 day moving average at $23.68, and through time should regain the 100 day moving average at $26.11 and eventually the 200 day moving average at $27.87. This recovery won’t be without volatility but I will be looking to use weak days to accumulate ALL stock as I genuinely believe the worst is behind it now both fundamentally and technically. It’s also worth noting around 30% of the register has changed hands in the last six months which suggests weak holders have exited the stock. I realise some people have ethical issues with owning gaming stocks or those who manufacture gaming software. I do have sympathy for those views as the social cost of problem gambling is enormous. However, the company operates in a highly regulated market and my job as a fund manager is to invest in the best of breed companies in structurally growing industries. ALL fits that description. As I said earlier in this note, I do believe a broader better buying opportunity will emerge again in equity markets over the next few months. I feel ALL trading on a PEG ratio less than 1x will be a good place to put some cash to work into a broader market pullback. That’s my final point today: this is going to remain volatile. I don’t believe there’s any great rush to do anything and that patience in times of volatility will be rewarded. Wait for you moments to act: they will come. Want to learn more about Aitken Investment Management? Hit the 'contact' button to get in touch with us. I got side tracked. https://www.youtube.com/watch?v=dFTusBp0aT8 classic.. now let me read the article. Most brokers and fundies, including Charlie, got ALL wrong in 2018. Very little reason to think that is going to change this year.